What else could I possibly wear on New Year's Eve besides Lynnderella New Year's Eve Eve?? I know this was a popular choice for Lynnderella lovers last night. I debated about what to use for undies and I almost went with Essie Butler, Please, but I decided on my favorite silver, Sally Hansen Insta Dri in Silver Sweep. 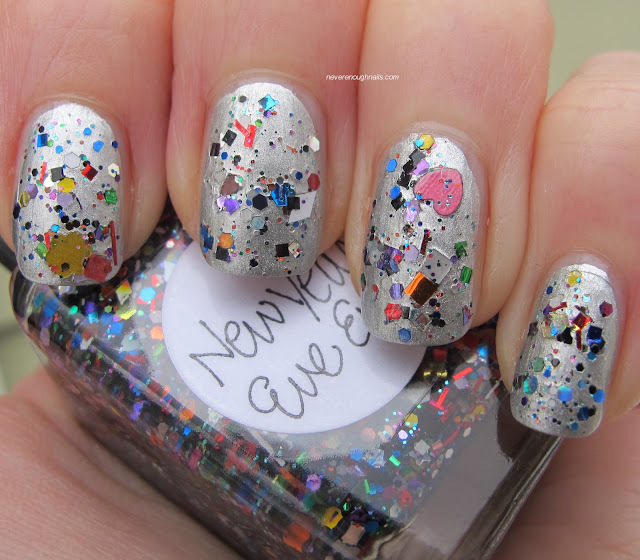 New Year's Eve Eve is a multi-colored and multi-shape glitter along the lines of Lynnderella The Glittering Crowd, but this one contains a cool mix of shiny, matte and satin glitters. NYEE also has more of the large glitter in fun shapes, like hearts, flowers, and stars. The Glittering Crowd doesn't have any of those fun shapes, so they end up being really quite different. The fun shapes were just pouring out when I did this mani. I got three of these big yellow/gold flowers, a blue satin heart, a matte pink heart, a holo silver heart (on my right hand- not pictured) and a bunch of matte white diamonds. I did not fish around for any of these shapes, they just came right out! I love when that happens! There is a lot of holo glitter in NYEE as well, but I had a hard time capturing it because the sky is pretty overcast today. You can kind see some of it in the picture below. This was really easy to apply, and like I said, no fishing was necessary. This is two regular coats of NYEE. 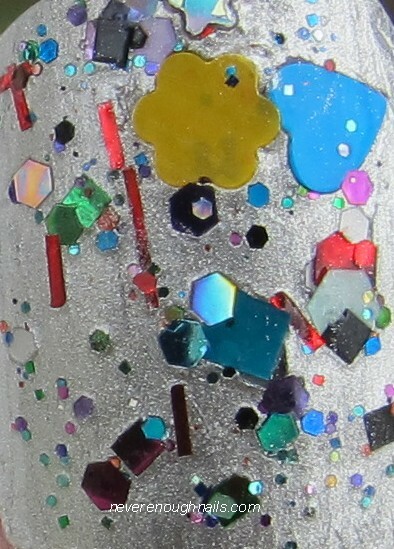 If you love these multi-colored glitters with fun shapes, you will need New Year's Eve Eve! How was your New Year's Eve? I am sick, so I was barely awake. I was very boring and really didn't do anything! I am never a big NYE fan, so it wasn't a big deal to stay in. I woke up this morning thinking about how much I hate the month of January... it's so long, dark and cold. There are no fun holidays in January. Here in CT, spring is not on our radar in January AT ALL. And it's sad because Christmas is all over. Boo hiss!! January is going to be an untrieds month here on Never Enough Nails, so at least that will be fun! I have TONS of polishes that are sitting there waiting for me to check them out! By the way, if you noticed the lack of a Top 10/20/whatever polishes of 2012 list here on Never Enough Nails, that's because I can never pick favorites like that. I love so many polishes, and I have occasional favorites, but I find it REALLY hard to do a list like that!! Lynnderella New Year's Eve Eve is available on her eBay store. Sally Hansen Silver Sweep was sent for review (a long time ago, and I'm never sure if I have to post this whenever I re-wear the polish, so here it is). For more information, please read my Disclosure Policy. That Lynn has such awesome funky shapes and colors! Cute mani! It really does look like confetti! Heather, I think it might be the most fun-shaped packed polish I own! They just kept coming! Sarah- it does! I thought it was really NYE appropriate! i also wore this! with silver undies. but i choose china glaze silver lining. so pretty! i love all the different shapes! Mani twins Hey-Hay! I love the different shapes too, they're so much fun! Never Enough Nails Stash Shots! New Spring Color Club Halo Hues Cosmic Fate!! Nicole by OPI Modern Family Part Three! Nicole by OPI Modern Family Part Two! New Nicole by OPI Shades for 2013! Nicole by OPI Modern Family Part One! Some Pretty and Polished News! OPI Mariah Carey Studio Shades!